Rabbi Mendel Nakkar was born in 1987 and raised in Toronto, Canada, where he absorbed the values of responsibility and devotion to his fellow Jews. He grew along with the community and celebrated his milestones in tandem with those of the community. Rabbi Mendel Nakkar studied in Yeshivah Tomchai Temimim Brunoy, France for his high school years. He furthered his studies in educational institutions in Canada, France, Germany, and the USA. Rabbi Mendel Nakkar spent a year in Cincinnati, Ohio, studying and serving as a mentor for teenage boys in Yeshiva. He received his rabbinic ordination from Rabbi Zalman Labkowsky in 2010, from the Tomchai Temimim United Lubavitcher Yeshiva in New York. He spent his summers as a successful staff member in the Lubavitch day camp in Toronto. He later served as head staff member of Camp Gan Yisroel in Brooklyn, New York, where he dedicated his summer giving to the campers - many coming from unaffiliated backgrounds - physically, emotionally and spiritually. He volunteered for the Jewish community in various capacities throughout the years: including outreach activities, conducting Shabbatons and Holiday events for youth. For several years, he volunteered as a teacher in ‘Released Time’ – a program that brings Judaism to children attending public school. In addition, he provided private tutoring sessions for boys preparing for their Bar Mitzvah. Moreover, after working several years at the Lubavitch day camp in Toronto (geared for children until age 12), he noticed the lack of a program which caters specifically for graduating campers and teens at large. For this reason, at his own initiative he established (in 2010) the ‘Jewish Teens Zone’ – a teen camp that offers the ultimate fun experience in a Jewish environment. For the following 4 years (2010-2013) he administered, coordinated, and managed the entire summer camp. See more at www.jewishteenszone.ca. All who meet Rabbi Mendel Nakkar are drawn to his warmth and dedication. Rabbi Mendel Nakkar has called upon his extensive background in Jewish knowledge and its inner dimensions, coupled with his innate warmth, charisma and personable nature. Rabbi Mendel Nakkar has charted a path in meeting the needs of the Jewish youth and sharing the infinite wisdom of Judaism with others. Muci Nakkar (nee Liberow) was born in 1989 and raised in Porto Alegre, Brazil. Her parents, Rabbi Mendel and Mimi Liberow, originally from France and Tennessee, respectively, imbued their children with a sense of unconditional devotion to the Porto Alegre community. Muci graduated from Porto Alegre’s Beit Chabad Elementary Shcool in June 2003, proceeded to attend high school in Jerusalem, Israel and then furthered her studies at Shoshanat Yerushalaim seminary in Jerusalem and Bnot Chabad teachers’ seminary in Vienna, Austria. She put her teaching qualifications to use during the following years as an educator of early childhood. As the daughter of the founder and senior rabbi of Beit Lubavitch Porto Alegre, Muci took personal interest in the success of the organization. Empowered with a sense of purpose and devotion to her fellow Jews, she began her career of giving to others at a young age. Muci volunteered for Beit Lubavitch in various capacities throughout the years, including: preparing and running holiday events and programs, Toddlers circle, ‘Lunch & learn’, Hospital and senior visitations, Judaic classes, as well as assisting with Synagogue functions. In December 2010, she married Rabbi Mendel Nakkar. Up until the summer of 2013, they lived in Brooklyn, New York where Muci taught in the Chabad of Midtown Preschool, and Mendel continued his Torah studies and ran various outreach programs. 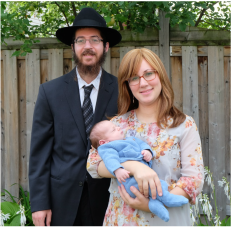 Inspired by the Rebbe's campaign to prepare the world for the coming of Moshiach, they currently endeavor to take part in this crucial mission by reaching out to every Jew in The Simcoe County, providing a wide variety of educational, religious, and social services. Their emphasis is on sharing the treasures of our tradition and affording every Jew the opportunity to experience his or her wonderful Jewish heritage.